HTC has launched the new HTC HD Mini an HTC Sense-based Windows Phone.Sensible phone for smart people.with all the advanced features embedded in it. It has exclusive two Android phones. With an advanced technology HTC and HD2 are especially designed to come up to the expectations,amazing! With an ultimate compact design the HTC HD mini fulfils your desire because it pursue all those features and capabilities that makes you ahead and that what you expect from your mobile.The integration of HTC Sense and Windows Phone on HD mini and HD2 with an add on of sleek mobile with advanced windows facility. Now using advanced techniques of mobile has become easy...really HTC HD Mini has HTC Sense that makes using of phone easy. 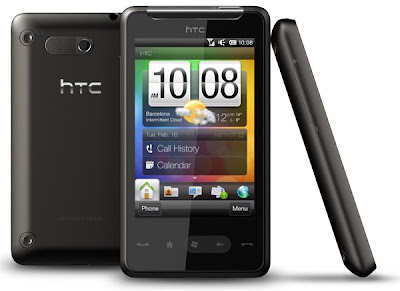 New HTC HD2, the HTC HD Mini focus on people-centric communication with total Outlook integration that is its important feature. U can follow your twitter system as HTC’s Windows-based Twitter application, HTC Peep, enables you to do this very easily. Mesmerising HTC HD Mini has exclusive zooming and resizing websites, special capaciitive touch for viewing and you can have all the stuff like PDF documents and pictures and Microsoft Office files just need to pinch. Other eye catching features are with 3G broadband connectivity, the HTC HD mini also offers personal Wi-Fi. You can download variety of applications from the Windows Marketplace. Branded HTC HD mini has got all the exclusive features that makes it special from others. Be special and buy special HTC HD mini.